Search Crash.Net by typing in a keyword. Viso takes pole despite yellow flags. MOTOGP » Gibernau: Race pace more impressive than pole. F3 » Podium start to weekend for Carroll. BSB » Lavilla 'beggars belief' in Thruxton qualifying. WRC » Solberg still leads, but penalty dents advantage. Ernesto Viso took his first outright Formula 3 pole position at Knockhill, in a session that had to be stopped twice as cars spun off. Will Power claimed the second spot on his first visit to the Scottish circuit, while several drivers complained about traffic on the 1.3-mile track. Viso's best lap was set when he made a pass on Ryan Lewis through the Taylors hairpin as yellow flags were being waved for Vasilije Calasan's car, which had spun on the exit. The Venezuelan dived down the inside of the Scholarship championship leader and locked up his brakes, but managed to improve his time as he crossed the line. Calasan's stranded car brought the red flag out for the second time in the session, the first having been when Fairuz Fauzy went backwards into the tyres at Duffus Dip after just five minutes on the track. Fauzy's session was over but team-mate Will Davison was not to fare much better. Both Menu Motorsport drivers had handling problems, and the Australian ended up only 14th. Davison, though, was only one spot behind Nelson Piquet Jr, who was disappointed by both traffic and the handling of his car to end up down in 13th, while his countryman and championship rival Danilo Dirani was only tenth, after spinning off at the challenging Glenvarigill chicane half way through the session. The Brazilian blamed lack of experience at the circuit for the error, and was confident of claiming a top five spot for the second race of the weekend. Karun Chandhok was another driver to fall foul of the chicane and ended up eighth after running at the front early in the session. Although he missed out on pole by just over a tenth of a second, James Rossiter was happy with third place as his two Brazilian title challengers were well down the order. The third Brazilian, Lucas di Grassi, will line up alongside Rossiter for the first race, despite a spin at the chicane at the very end of the session, while round two winner Clivio Piccione took fifth. 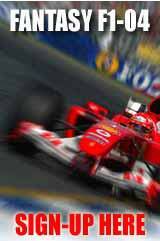 Win a VIP Trip to the 2005 Oz GP with Crash.Net. Are you playing Pure Racing Fantasy F1 Manager? VIP Trips to the Australian and Monaco GP's to be won. Plus meet Jenson Button at the British GP! Click Here NOW! » Ernesto Viso in action at Snetterton. » Race result: Euroseries, Pau - Race 2 [updated]. » Piquet wins as Rossiter's engine blows. » Lapierre breaks duck in Pau. » Green inherits Pau victory after Prémat exclusion. » Lights to flag victory for Rossiter. SIGN UP NOW for SMS news and updates direct from Crash.Net to your mobile! © 1999 - 2004 Crash Dot Net Limited.